You are traveling through time and space, engaged in a long journey of return to your Ancient Home. In this life and beyond, this journey continues. It is not a journey you make just for yourself. It is a journey you make for all those who have lost contact with the Creator of all life. It is a journey of Separation and return. It is a journey towards a greater experience of your purpose and your destiny. The journey is so very different from what people imagine because the imagination cannot contain a reality this great. Words, like ideas, give limit and form to things, but they cannot encompass greater realities. This requires reverence and resonance to experience the truth at a larger level. Ideas and beliefs are fine for small things. But a greater reality—the reality of your journey through time and space—is beyond what your imagination or your intellect can conceive of at this moment. You can only give analogies here. 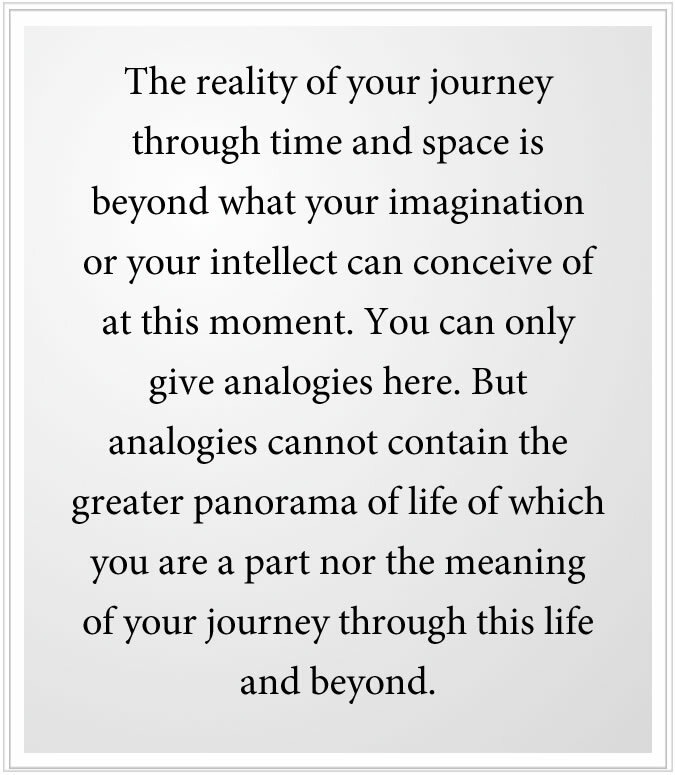 But analogies cannot contain the greater panorama of life of which you are a part nor the meaning of your journey through this life and beyond. The heart can understand, but the mind cannot contain a reality this big at the level of its own ideas. That is why the reality is so very different from what so many people think and believe. When the Separation from God began, you could not separate completely because a part of Creation is within you and has stayed within you, and you cannot get rid of it. It is as if God goes along for the ride. Wherever you go, God is there, within you and around you. You may say, “I don’t want to believe in God. I don’t want anything to do with religion.” That is fine, but God is still within you, and God is all around you. You may think, God is all about this teacher—my savior, my saint, my prophet—but God is still within you and all around you. You may claim that God is responsible for events of the world or events of your life, but God is still within you and all around you. The mind thinks, the mind admonishes others, the mind proclaims great truths according to its experience and range of understanding, but the reality is beyond this. You are separated in your own mind, and the intellect is a product of this Separation. It thinks it is who you are. It thinks it knows what reality is. It thinks it is your soul and your Being. It thinks its thoughts represent its reality and distinguish it from other minds who have other thoughts. Your mind thinks that its reality is the reality of its ideas and its association with people, places and things. But who you really are is beyond all this. Because God has remained within you, God’s Knowledge has remained within you. And this Knowledge now is here to guide you, to protect you and to lead you into a greater experience of life so that the Separation within you may be dissolved. This purpose and this destiny that Knowledge holds for you is to contribute to a world in need, within the very circumstances that you see today and which will be arising in the future. From the standpoint of Knowledge within you, you are here on a mission. You have a greater purpose for being here. You are not merely an animal trying to survive, trying to be satisfied, trying to be happy, trying to be secure. You are a Being from Heaven, who is part of the Separation, who is now here to work towards your own self-discovery and redemption. While your mind continues to try to conceive of itself and attach itself to people, places and things, Knowledge within you is moving. It is advising you, it is counseling you. If you can hear it, you will benefit from it. But if you cannot hear it, then you cannot receive its wisdom, its blessing and its empowerment. Your success in this life does not cast you to Heaven or to Hell, but sets you on the next stage of your journey. If you are to regain wisdom and compassion and a degree of self-awareness, then you will be prepared for a greater level of service. People think this one life is their whole existence in physical reality. Some people even think that physical reality will come to a final ending point within their lifetime. These ideas are the result of the limits of your imagination. To conceive of your life continuing beyond this into other arenas of life and other levels of service is really too much for most people to consider. They do not have the capacity to think at this level. So the idea of a Judgment Day is invented. But why would God judge you when God knows exactly why you are doing what you are doing and when God understands that the world is a place of such immense difficulty and persuasion that without Knowledge to guide an individual here, they would surely fall into error, sometimes grievous error? God is not going to punish you for living in a state like this. God is going to call you to come to Knowledge within yourself, so that you may have the Power and the Presence of God to guide you, to protect you and to lead you forward. There is no Judgment Day then. This is something people invent because they want justice to be carried out in Heaven where it is not carried out on Earth, according to their notions of what justice should be. They want the wicked to be punished, even if they themselves cannot punish those whom they think are in error. This is merely a projection. The idea of an angry God has been promoted over time in many traditions to force allegiance of belief, to frighten people into believing in a particular religious idea or doctrine. People worship God, and their whole idea of God is based on a kind of subservient mentality where you have to please God or God will punish you. God will ruin your crops. God will bring pestilence. God will bring devastating weather. And so, over the course of time, people think they have to please God or they will face terrible consequences here on Earth. But the truth is they have entered a reality that is by its very nature extremely difficult and problematic, a reality that is unpredictable and, though it follows basic patterns, is quite chaotic. This is the physical universe that has been created as a place for the separated to live, in a separate reality. It is wonderful and terrible, beautiful and frightening. It is attractive and, in some cases, repulsive. It is so unlike your Ancient Home from which you have come and to which you will eventually return. And yet it is a place that requires contribution. It is a place of action. It is a place for giving. It is through this place that the soul must journey now. You are in the world for a greater purpose. You did not invent this for yourself. You cannot change this purpose, but how and if it will be experienced is up to the events of time and to your own decisions regarding it. So while your purpose is pre-determined, the events of your life are not. At this level of existence, chance plays a very great role, and the importance of your decisions plays a very great role. Some people want to think that God is controlling all of the events of life, but that is not true at all. God has set in motion the geological and biological forces that have shaped the evolution of life. But these forces are self-perpetuating and do not require God’s intervention. So if the earthquake happens, it is part of the geological process. If famine and pestilence occur, it is largely the result of forces beyond your control. God is not punishing you. But this is the reality where you must choose. It is whether you choose reunion with God or Separation from God. You choose this every day. You choose this in what you choose to think about, what you choose to believe in and how you choose to respond to difficulties and decisions in life. Your mind is formed in isolation, and so it believes of itself as being a singular entity, an entity apart from other entities. It distinguishes itself and tries to use the body to distinguish itself. It is a product of Separation, and it reinforces Separation. But you also have a deeper Knowledge within you, a deeper Knowledge that has been placed there by God. It cannot be persuaded. It cannot be seduced. It cannot be induced to do things that go against its primary nature. It is like you have two voices in your mind. You might have more than two voices, but they all come down to being a voice for Separation or a voice for reunion. But the voice for reunion does not think like your mind. It does not deliberate. It does not speculate. It does not judge and condemn. It does not base its reality on ideas or concepts or allegiances. Your surface mind—your mind that has been shaped by culture, by your family, by tradition and by your response to a changing world—this mind must serve a greater Mind within you if it is to become redeemed and if its great abilities are to be utilized beneficially for your sake and for the sake of others. That is why Knowledge has been placed within you to guide you. For God knows you would become lost in the world without this Knowledge. You would fall into error, and you would live a life of conflict, difficulty and self-repudiation. Your journey, then, is to return to the power and presence of Knowledge. Or, said in other words, it is to become true to your deeper conscience, true to yourself, true to what you most deeply feel and know. This can be described within religious terms or outside of religious terms, but it amounts to the same thing. With Knowledge, you discover you are here for a greater purpose, and you see that you are being guided in certain ways and restrained in other ways. As you gain more confidence, you are able to follow this and to receive its great blessings and its great lessons about life. You do this without condemnation of yourself or others. You do this in humility, realizing that you are following a greater power, a power that is beyond the scope and reach of the intellect. You place yourself here as a student, a student who presumes very little and is open to learn everything that must be learned. Here you do not live according to answers, but you live with questions. The intellect cannot do this, for it is far too insecure. It must have answers, and so it provides its own answers. It is too insecure. It is too feeble to live with questions. That takes a greater strength within you. You live with questions you may never be able to answer, but you live with them because they open your mind, and they stimulate a deeper connection with Knowledge within yourself. Knowledge is the answer because as you become stronger with Knowledge, you have greater certainty, you have greater confidence and you have greater strength and ability. You can face danger and uncertainty without anger and condemnation. You can face questions for which you do not have answers with inquiry, openness and humility. You have the power to restrain your self-destructive tendencies and to distinguish the thoughts in your mind that are truly beneficial from all of the thoughts that you have absorbed from the environment around you. If you become strong with Knowledge in this life, you will be given a greater level of service beyond this world. This may be service in this world or in other worlds. It may be service as a transcendent teacher, one of the Unseen Ones who guides those who are still living in form. Or you may return to the manifest world as a great teacher, as someone who has great promise to shed wisdom and guidance and resolution in another existence. Here there is no Judgment Day. There is only progress. You cannot return to your heavenly state full of anger, resentment, self-judgment and condemnation of others. You cannot return to your heavenly state full of indecision and ambivalence, with addictions and self-destructive tendencies. You just simply cannot return in this state of mind. To think that all these things can be resolved within one life is to underestimate the problem. Even if you could resolve all of these things in one life, your accomplishment would be so great that God would want to use you to help others who are still lost in their state of Separation. So you could not return to Heaven even under these circumstances. God is going to get maximum use out of you and maximum use and benefit from whatever wisdom you can acquire living in the physical reality. This is not a punishment because what undoes all of the tendencies and the memories and the suffering born of Separation is contribution, is service. God does not merely dissolve all of these things within you because God did not create them. They must be dissolved within you, by you and through you, by taking a different course in life. Your errors are replaced with service. The service comes from deep within you. It is not a scheme that you create to try to offset guilt within yourself. It is something that emanates from Knowledge within you. It replaces the memory of Separation with the memory of contribution, communication and connection with others. It is by following the true master within yourself that your previous errors in judgment and unhappy experiences are erased and forgotten. People cannot see this because they cannot imagine what Heaven is like. When you are living in the world, thinking you are an individual, you cannot imagine what Heaven is like. For imagination is how you give form to your ideas, and the form is extremely limited and temporary. That is why you cannot imagine permanent things. You cannot imagine peace. Everything you imagine is limited and temporary in nature. Your experience of this happens at a deeper level. The mind can only imagine things it can think of. But if it cannot think of Creation except in very limited terms in time and space, then obviously you must experience your deeper nature beyond the realm of your intellect. Your intellect is how you evaluate life from a position of Separation. But if the Separation is not real and can never be complete, then your ideas must be relative in nature. Perhaps you can see the truth of things in time, of momentary things. You can solve problems because that is what the intellect is for. It is to solve problems within a limited range of your experience in this life. This is the real value of the intellect. In service to Knowledge, it is a wonderful instrument of communication. That is what it is for, and that is what redeems it and gives it a greater purpose and a greater meaning. Your happiness in life will be born of your connection to Knowledge and the great service it will render through you, and the redemption it will give to your mind and to your emotions. You will finally begin to feel right within yourself and outgrow the discomforts that attended you before. It will free you from giving your life away to people and things and places inappropriately and prematurely. It will free you from all the suffering of indecision, self-doubt and self-recrimination. It will do this gradually because it takes time to change, to shift your allegiance within yourself—allegiance from your ideas and the ideas of others to a deeper power that is guiding you from within yourself. You begin to recognize this power in others and to see its central importance in your life and in the welfare of all of humanity. You do not need to concern yourself with what is beyond the world because you have not reached that junction yet. Your mind cannot conceive of your life before this world except in historical terms and in imaginary terms. Perhaps you will have certain memories of things that happened before, and those could be real. But they are out of context, and you cannot understand them fully. It is this life to which you must give your attention. You are here for a greater purpose. Only Knowledge within you knows what this purpose is and holds this purpose for you. This is the journey that you are taking, and you are taking it step by step in stages. As Knowledge becomes realized within you and you are able to follow it in specific matters, your experience of it will grow stronger. And you will realize that redemption has been placed within you to guide you, and that redemption is not just a product of believing in concepts or accepting doctrines or going through the motions of expressing devotion to a supreme power in the universe. Really, your responsibility to God is to discover, to accept and to express this greater purpose that has brought you into the world. To do this, you must follow Knowledge, allowing Knowledge to be mysterious, for it exists beyond the realm of your intellect. This leads to a great re-evaluation of your life. For with Knowledge, you see things differently, and your values change, and your priorities change. Perhaps you have experienced some of this change already. When you begin to experience Knowledge, you seek quiet instead of stimulation. You seek honest engagement with others instead of meaningless conversation. You seek the experience of union in relationships rather than just using another to gain personal advantage. You value your insights more than your thoughts. You begin to see over time that who you are is not your mind, and that your mind is really a wonderful instrument of communication for the Spirit, for Knowledge. You see your body as a vehicle for being in the world, a vehicle through which communication can flow, through which contribution can occur and through which a deeper association with others who are here in the world can be experienced. You are here on a journey in the world. You have the choice of whether to be lost in the world or to be able to experience a greater purpose and reality being in the world. These two approaches render an entirely different experience of life from one another. You can look around you to see the consequences dramatically being portrayed by people choosing to live in Separation, and the suffering and the uncertainty and the disastrous decisions that result from taking and maintaining this position. If you look, you will find there are far fewer examples of people following Knowledge. 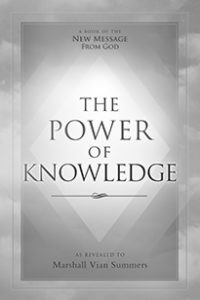 You will see the evidence of Knowledge in their lives, and this will inspire you and remind you that Knowledge lives within you as well and that wherever you go and whatever you do, God is there. You have a deeper conscience that tells you when you are doing something that is good and when you are doing something that is not good for you. In time, you will learn that when you see error in others, it is a demonstration that they are not being with Knowledge, and you will use this to reinforce your commitment to Knowledge. Rather than condemning the person or the situation, you will see the great need for Knowledge. With Knowledge, there will be no war and conflict. People may disagree about how to do things, but they will resonate regarding what must be done, what must be resolved. Knowledge is united within people and between people. It is the great peacemaker in the world. It is the power that overrides the tendencies to condemn, to attack, to act selfishly and to seek to conquer others for your own benefit. It is as if you have competing forces within yourself. They are entirely different. They have entirely different directions. They cast an entirely different experience and understanding of life. They are leading you in different directions. So every day you choose which to follow, what to honor and what to look for in yourself and in others. As this becomes a conscious act, then you will feel you have a much greater authority and ability to determine the kind of experience you will have. If you go with Knowledge, you will feel good, and you will resonate with yourself. If you go against Knowledge, you will be uncomfortable, as if a betrayal has occurred. You can go against Knowledge for many different reasons: for wealth; to acquire beauty; to acquire people, places and things. But within yourself you will not feel good about it. If you choose anger and condemnation of others, you will feel very bad within yourself. You might feel justified, you might think that you are in the right, but you will feel bad within yourself. Your deeper conscience is being violated, and you will feel bad within yourself. You may try to create your own reality and make your life into whatever you think it should be or that you want it to be, but you cannot violate your deeper conscience without creating suffering within yourself. Here what is good and what is bad are merely known. In the complexities of trying to resolve problems and dilemmas, this basic conscience can be clouded, and it might be more difficult to recognize what is the correct way to go. Here the intellect comes into its real service. It must determine how things should be brought about. It deals with the details, dealing with specifics, but the real direction must be set by Knowledge. You have an ethical and moral foundation within yourself that was created by God. Even if it conflicts with your cultural values and with your social conditioning, it cannot be changed. Your culture may teach you to condemn others and to punish others for certain behaviors, or to distrust other groups or other tribes or other nations. But this is a violation of your deeper conscience. So you have a social conscience that is your social conditioning, but then you have a deeper conscience that was created by God. It is the great blessing of your life that the Separation never could be complete, and that within yourself what God has created remains. It is this that will save you. It is this that will guide you and restrain you from giving your life away and from making critical mistakes. The world is the perfect place to reunite with Knowledge, for the need is immense. Without Knowledge you are lost, with only your desires and your fears to guide you. You do not have to be religious. You do not have to belong to a religious group or adhere to a religious teaching to return to the power and presence of Knowledge within yourself. It will serve you within or beyond a religious tradition in any world, in any nation, in any culture, in any situation. But here so many people are strangers unto themselves. It is to be reacquainted and reunited with Knowledge that represents your most fundamental need in life. Beyond acquiring food and shelter and the basic necessities of survival, this is your most fundamental endeavor. To take the Steps to Knowledge, to become a student of Knowledge, to learn The Way of Knowledge is to learn the way of a greater life. You need this every day, in every one of your decisions. You need this to escape from the Hell that you have created for yourself—from the Hell of uncertainty, from the Hell of self-judgment, from the Hell of insecurity, from the Hell of anxiety, from the Hell of fear and from the Hell of condemnation of yourself and others. When you realize that this is Hell, and that it is not just your normal state, you will begin to look more deeply for the evidence of Knowledge. When you realize how much you are suffering, how much you are losing and how many mistakes you are making, you will want to find the source of certainty within yourself and within others. You will want this certainty to be the basis of your decision making and the foundation of any relationship that you establish with another person. God has sent you into the world to contribute unique gifts involving certain people in certain situations. You must find these people, and you must find these situations. You will feel an urgency here. Even if you misconstrue these deeper needs, they will exist within you. They will lead you on. In the meantime, you marry people, you become attached to places, you give your life to certain things. But these deeper needs remain, and until they are met, you will be restless, you will feel that your life must move on, you will not be content with what you have. For these represent the deeper needs of the soul, the most fundamental needs within you. The soul’s needs can only be met by your discovering and fulfilling your greater purpose here. Since your intellect cannot figure this out, you must follow the guidance of Knowledge. And you must learn of the power and the presence of Knowledge within your life. It is really very simple, but it will not seem simple because your mind will be confused. Because Knowledge is mysterious, it does not fit in with your ideas. You cannot control it; you cannot define it; you cannot express it to your friends in words because Knowledge is a profound experience of seeing, knowing and acting. It will seem rare and confusing at the outset, but in time you will see that it is the most natural thing for you to do. This is your journey in the world. It is a journey that will continue beyond this world. It is a journey that you cannot define by ideas alone. 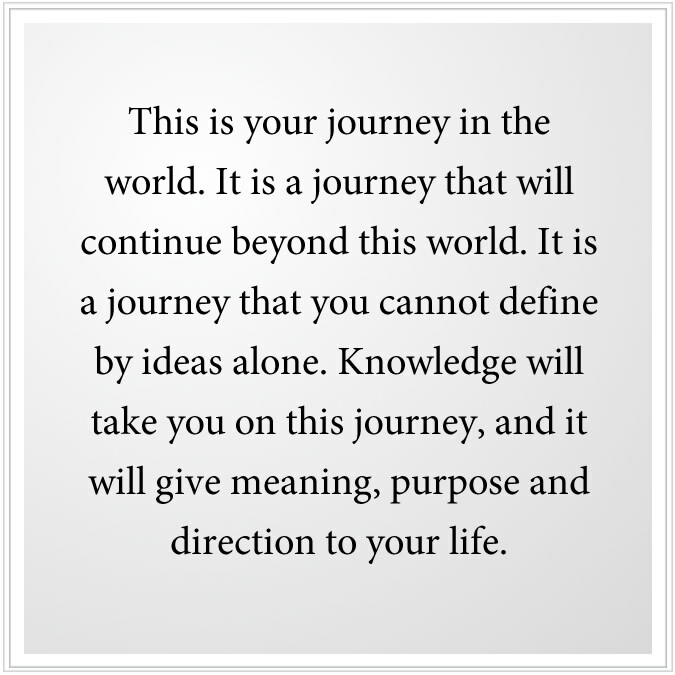 Knowledge will take you on this journey, and it will give meaning, purpose and direction to your life. You will see that there is a deeper current of your life. Beyond all of your thoughts and the events of the day, there is a deeper current running in your life. This is what will give you strength and purpose and wisdom as you proceed. It is necessary here for you to realize that who you are is not your mind, not your thoughts, not your beliefs and that your true existence is beyond them—beyond these things and that God is beyond these things. An idea cannot be a replacement for a real relationship. And real relationships transcend your ideas. Your real relationship with God transcends your ideas, or the ideas of your culture or your religion. In time, you will shift your allegiance to the power of Knowledge. This is shifting your allegiance to God. This is undoing the Separation at the very foundation of your Being. Here you are able to use the mind rather than being ruled by it. Here you are able to use thoughts and definitions instead of being ruled by them. Here you will be able to use the marvelous capabilities of your intellect and your body instead of being a slave to them. This is a practical form of liberation, and it will return you to your most essential nature, and to the greater purpose that has brought you here, into the world, at this time.